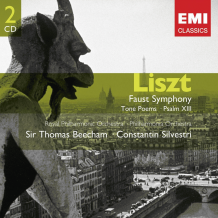 Sir Thomas Beecham/Royal Philharmonic Orchestra - Liszt: Faust Symphony; Psalm XIII; Les preludes, Tasso etc. Liszt: Faust Symphony; Psalm XIII; Les preludes, Tasso etc. ℗ As shown. This compilation (P) 2005 by EMI Records Ltd.